Rabbi Shmuel Rabinowitz, the rabbi of the Kotel (Western Wall) and Holy Sites, decried the Arab attempts to wreck the week-long Sukkot holiday by launching violent riots against police and Jewish visitors on the Temple Mount, the holiest site in Judaism. 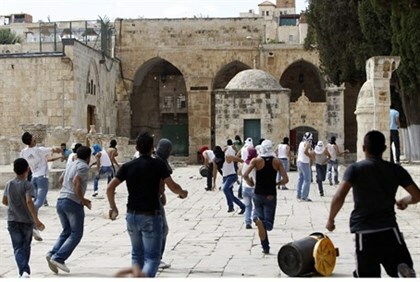 Speaking to Arutz Sheva, the rabbi argued that the Arab rioters are intentionally trying to prevent Jews from reaching the site on Sukkot, one of the three Jewish pilgrimage holidays that in ancient times required Jews to travel to the Temple in Jerusalem, a practice maintained by many. “If someone harms the holiness of the site it’s the rioters manipulating the sensitivity and holiness of the location to harm the gentle fabric in the Old City, throwing rocks and molotov cocktails from the mosque,” emphasized the rabbi. The Jordanian Waqf (Islamic trust) that holds de facto rule over the site has banned Jewish prayer at the site, while at the very least turning a blind eye to constant violent rioting. According to the rabbi, the Al-Aqsa Mosque is not being treated as a holy site by the Waqf – rather it is a political trump card. Ahead of the first day of Sukkot on Wednesday, Muslim rioters hurled rocks and fireworks at police wounding at least four officers; in response, Jordan blamed the victim by condemning Israel for arresting nine attacking rioters during the chaos. Shabak (Israel Security Agency) revealed in May that senior Hamas terrorist Mohammed Toameh had been captured and admitted in investigation that the group funds violent riots on the Temple Mount.